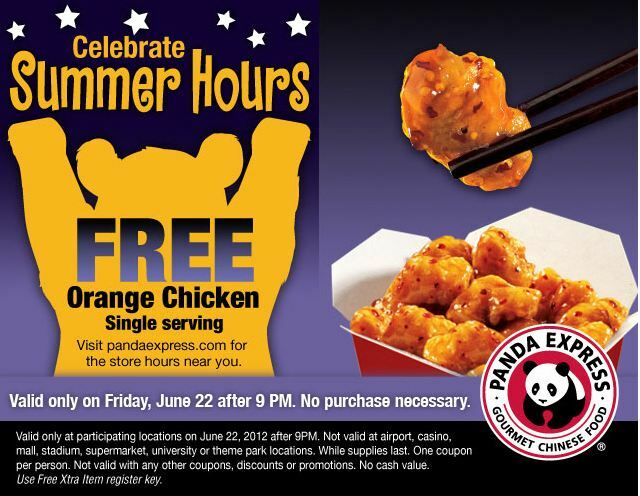 FREE Orange Chicken At Panda Express 06/22 ONLY! Love that orange chicken? Well make sure to print this coupon and head to Panda Express on 06/22/2012. You can grab a FREE orange chicken at participating Panda Express restaurants until 9PM. There is no purchase necessary. Who doesn’t like free food? *Coupons are good for one person, so we usually print 4 for a super cheap dinner! Make sure you call your local restaurant to check their hours not all locations are open late. This entry was posted in Food Deals, Free Food, Freebies and tagged coupon, Free, free food, Panda Express by AustinCouponing.com. Bookmark the permalink.